What's my ideal story? An action-adventure-mystery with a smart and quirky female protagonist, an unlikely companion, sharp dialog, quick humor, a touch of fantasy, and a grouchy mythical beast. Seriously. The attitude of the mythical beast is a deal-breaker. As if my ideal story checklist was somehow leaked to Jackson Pearce and Maggie Stiefvater, Pip Bartlett's Guide to Magical Creatures delivers every single point from my list bundled with the bonus of cute and clever illustrations. Can you already tell that I'm in love? Pip Bartlett can understand magical creatures. Because not everyone has that ability, it often leads towards trouble for her. After one particularly embarrassing incident involving a handful of unicorns who show off and let their egos get dangerously out of hand, Pip's parents decide that maybe it's best for her to spend the summer with her veterinarian aunt at the Cloverton Clinic for Magical Creatures--you know, to get her out of town for a while until the situation settles down. Mysterious fires erupt all over town and Pip and Tomas discover that Fuzzles (the only magical creature that Pip can't seem to communicate with) are the cause. With a bit of teamwork, a little luck, and whole lot of stepping outside of their comfort zones, Pip and Tomas are able to figure out why the Fuzzles have suddenly infested Cloverton and then come up with a clever and humane solution for dealing with them. It's easy to love this book if you've ever felt like an outsider, a weirdo, or even just a little bit odd. Pip's weirdness is really more of a superpower when you think about it, but she never lets the advantage she has with magical creatures go to her head. Modest is hardly a strong enough word to sum it up. Though she's young and at times emotionally vulnerable, Pip has enough love, empathy, and compassion in her little body to make you wonder how she's able to contain it all. Still, her self-consciousness often acts as her biggest obstacle. Middle-grade or not, who can't relate to that? In short: Pip is an easy kid to cheer for. The plot is well-paced and delightfully unpredictable, the characters are complex enough to satisfy both younger and older readers, and the story is complemented by a strategic sprinkling of lighthearted drawings and handwritten notes from Pip herself. It's a fun read the first time around and well worth reading again and again. 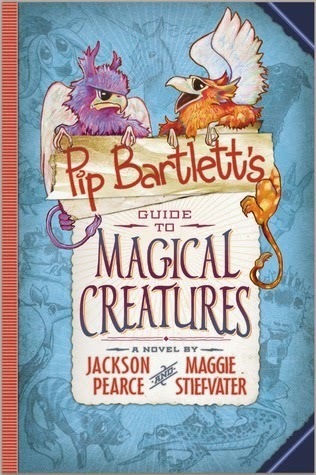 Because the back flap of Pip Bartlett's Guide to Magical Creatures makes reference to "the Pip Bartlett series", I hope that we'll be seeing many more adventures of the quirky heroine and her allergic companion from Pearce and Stiefvater in the future!